As a movement against punitive segregation in local prisons and jails, a new report by the New York Civil Liberties Union reveals more disturbing details than ever before. The subject of the protest was the abuse of prisoners—not at Guantánamo, Bagram or some distant black site, but on Rikers Island, less than ten miles away. The protesters, members of a new advocacy group called the New York City Jails Action Coalition (JAC), argue that conditions there—particularly solitary confinement—constitute torture in their own backyard. The target of the protest was the New York City Board of Correction, which oversees conditions for the 13,000-odd men, women, and children who inhabit New York City’s jails on a given day, and whose monthly meeting was taking place inside. According to the City’s own figures, the number of isolation cells at Rikers has risen to nearly 1,000 and is still growing. The JAC also points to the existence of special solitary confinement units on Rikers Island, designed to hold teenagers and people with mental illness. Until recently, it seemed like New York’s penchant for solitary confinement might be irreversible too. 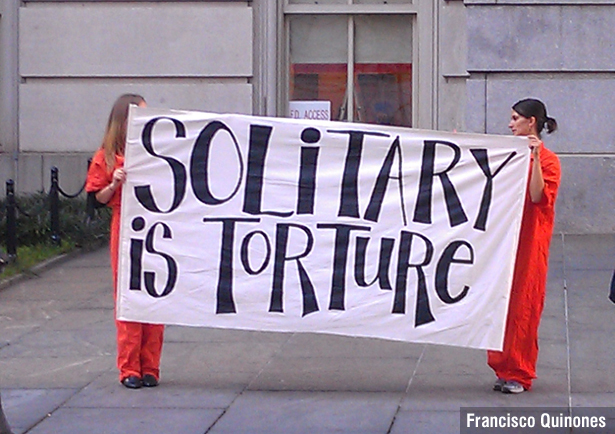 But a growing number of activists are working to combat the overuse of solitary in both the city’s jails and the state’s prisons. (New York City and New York State isolate their prisoners at the rate of about 10 percent and 8 percent, respectively—both rates more than double the national average.) In addition to JAC, which focuses on city jails, an informal coalition of prisoners’ rights groups and civil liberties organizations has formed to fight for change at the state level. Critical to both efforts are that they involve directly affected individuals—survivors of solitary and their families. And both draw on the work of an older organization, Mental Health Alternatives to Solitary Confinement, which has led a ten-year campaign to limit the use of solitary confinement on people with mental illness. Nearly 4,500 New York State prisoners live in extreme isolation at any given time, on twenty-three-hour lockdown in the small, barren cells that most refer to as “the Box,” either alone or with one other person. The report calls it “a world of unrelenting monotony, marked by isolation and idleness, where all extrinsic purpose and structure slowly unravel.” Confined to this world for months, years and even decades, many of the men in Special Housing Units (“SHUs,” New York’s label for solitary confinement) “unravel” as well. Prisoners are locked down on the say-so of corrections officials, with little semblance of due process. Gathering material on these “prisons within prisons” was no easy task, say the report’s authors. When we researched our story, “New York’s Black Sites” (published in The Nation in July), we learned that the press is barred from visiting the SHUs and interviewing inmates being held in “disciplinary segregation.” In addition to facing similar barriers, NYCLU endured six months of stalling on the part of the state Department of Corrections and Community Supervision (DOCCS) when they tried to obtain records under New York’s Freedom of Information Law. Under threat of a lawsuit, the state finally provided most—though not all—of what they were looking for. Also in attendance will be members of the Jails Action Coalition, whose focus on city jails could an even more difficult road to reform. Unlike Commissioner Fisher, who recognizes that a problem exists at the state level, the commissioner of New York City’s Department of Correction, Dora Schriro, denies that her jails even use solitary confinement. Schriro points to the fact that on Rikers Island, some prisoners in “punitive segregation” (which inmates call “the Bing”) are allowed out of their cells briefly—to go to the library, for example, or attend religious services. But “solitary confinement on Rikers is solitary confinement,” says Jennifer Parish, Director of Criminal Justice Advocacy at the Urban Justice Center (UJC). 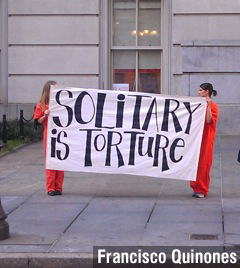 “People are confined to their cells, alone, for twenty-two to twenty-four hours a day.” Parish believes Schriro has “no understanding of how detrimental solitary can be,” especially for people with mental illness, who are put in special solitary units where their condition tends to further deteriorate, sometimes to the point of suicide. In fact, New York City is bucking a nascent national trend toward “rethinking” and reducing the use of solitary confinement, by actively expanding its use of isolation. “Every bed that can be converted is being converted” to be used for punitive segregation, Commissioner Schriro said at a November 17 meeting of the City Council’s Criminal Justice Committee.